1979-S Type-1 -- This is the Mint Mark some suggest was placed in use as early as 1968. It was also used for all business strike 1979-S Susan B. Anthony dollars and the majority of the proof coin mintages for all denominations in 1979. It is characterized by an indistinct to almost blob-like appearance (extremely blob-like on the later stages). It may come with or without clear fields or "attachments" within the center loops depending on the amount of punching pressure utilized to sink the image into the die and/or the amount of polishing the die receives. This is the more common variety for the year. 1979-S Type-2 -- This Mint mark was introduced in the later part of 1979 for proof coinage production (and referred to as Ty-2 for this year). It exhibits large bulbous serifs and rounder center loops than found on the Ty-1. 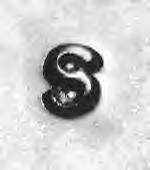 In spite of the fact that this variety is frequently and inaccurately referred to as "Clear S," it may come with or without clear fields or "attachments" within the center loops depending on the amount of punching pressure utilized to sink the image into the die and/or the amount of polishing the die receives. It does, however, have a greater tendency to be found with "clearer fields" within the loops than the Ty-1 but this is not a determining factor of type. There are only 425,000 possible complete 1979-S Type-2 Mint mark sets available, and out of these more than half have been broken up into singles. 1981-S Type-1 -- This is the same Mint mark as introduced in the later part of 1979 for proof coinage production (and referred to as Ty-2 for that year). (It is the first one used in 1981 and is thus designated Ty-1 for that year.) It exhibits smaller rounded serifs, or missing serifs, and more oval shaped center loops than found on the Ty-2. It may come with or without clear fields or "attachments" within the center loops depending on the amount of punching pressure utilized to sink the image into the die and/or the amount of polishing the die receives. This is the more common variety for the year. 1981-S Type-2 -- According to sources at the Mint, the single punch used to place the Mint mark letter on all proof denominations began to deteriorate rapidly early in 1981. It actually began to chip and break to the point that it was replaced with a new punch in October, 1981. This Mint mark was introduced in proof sets after November 1st, 1981 (and referred to as Ty-2 for this year). It exhibits large bulbous serifs and rounder center loops than found on the Ty-1. 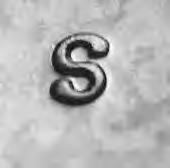 In spite of the fact that this variety is frequently and inaccurately referred to as "Clear S", it may come with or without clear fields or "attachments" within the center loops depending on the amount of punching pressure utilized to sink the image into the die and/or the amount of polishing the die receives. It does, however, have a greater tendency to be found with "clearer fields" within the loops than the Ty-1 but this is not a determining factor of type.